I just finished reading a novel that's worth reviewing here: American War by Omar El Akkad. Published last year, it's a story about the second American civil war, which in teh book lasted from about 2070 to 2090. Climate change is mentioned often, in and amongst the story. The ocean is rising everywhere, and Florida is mostly submerged. There's a mention of the Bangladeshi isles. Augusta, Georgia becomes a shipping port, and the Mississippi Sea has been created. 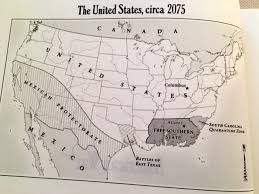 The reason for the war is that several southern states (of course) refused to give up fossil fuels when they were made illegal by the US government -- Mississippi, Alabama, South Carolina. Here's a map at the front of the book: The US is militarily organized; the South consists of several factions -- a somewhat organized military, various groups of freedom fighters, and men and boys who want to be where the action is. In the beginning of the book, the US (what remains of the 50 states) intentionally introduces a very virulent virus into South Carolina. As a result, the state walled off from both the US and the Southern states. The story begins by centering on a family in Louisiana. The father goes north to look for work and is killed by a suicide bomber. The rest -- mother, son and twin daughters -- go to live in a refugee camp, still in the South, and suffer the indignities present there. The novel focuses on one of these sisters, who grows to be physically tall and large, confident, and brave. An undercover agent recruits and trains her to be a lone, stealth fighter for the south, and she goes to the border and kills a prominent general and becomes an folk hero. But she herself is imprisoned on a remote Florida island, tortured, and nearly broken. In the end she commits an abominable act of revenge. I liked the novel for its science fiction -- how people reacted to climate change, and how it affected living conditions. It's told subtly, not overtly, but it's always looming in the background. My problem with the book is that I didn't really like the protagonist. She's confident but a bit of a bully. She struck me as emotionally disconnected -- from the time she's eight to her 20s or 30s. There's not much mention of her (formal) education, there's not much interest in other people (besides her immediate family) for their own sake, no mention of any romantic interests. She seems to wander through the book alone and bitter. She shaves her head. Eventually, after prison, she is so broken she sleeps on a dirt floor in a shed, and utterly alone except for a nephew she only begins to connect with. To me she didn't seem three-dimensional. But it's a book I'd recommend if you like reading about climate change in the future, and how the United States has gone to hell. Are there butterflies who flap their wings and so prevent storms and hurricanes? Reminder - the data are here: 0-700 meters, 0-2000 meters, and I calculate the global means per the area of the Earth (not per the ocean area only), since most (> 90%) of the "trapped heat" goes into the ocean. Event ID us 1000gcii ***This event supersedes event AT00PDOM8Q,PT18231000. California has it highest average July temperature since records started in 1895, and also its hottest month ever. In the last 30 years it has warmed at an incredible +0.35 °C/decade (+0.64 °F/decade). 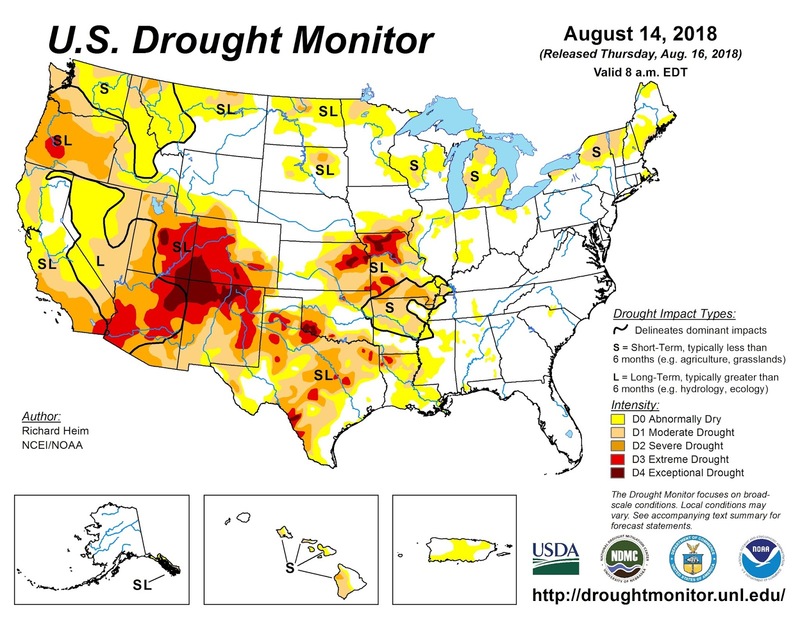 Overall the continental US had its 11th warmest July (NOAA). Its 30-year warming trend is +0.28 °C/dec (+0.51 °F/dec). 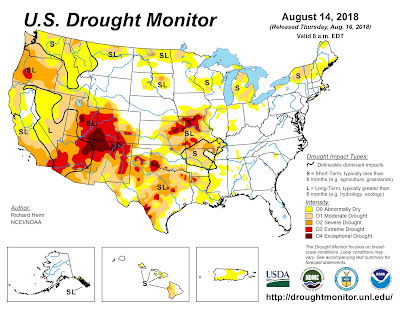 NASA's Carbon Monitoring System (CMS) has been cancelled, assumedly by the White House. But it hadn't been funded by Congress. It cost $10 M/yr. A scientist said, "If you cannot measure emissions reductions, you cannot be confident that countries are adhering to the [Paris] agreement." But how accurately can emissions be measured from space? I'm dubious. Naomi: "Is there a plan B?" Holden: "Yeah, make sure Plan A works." - The Expanse, S2 E13, "Caliban's War"
Still no date for The Expanse to appear on Amazon Prime without an extra charge. This fall, is what I've read. 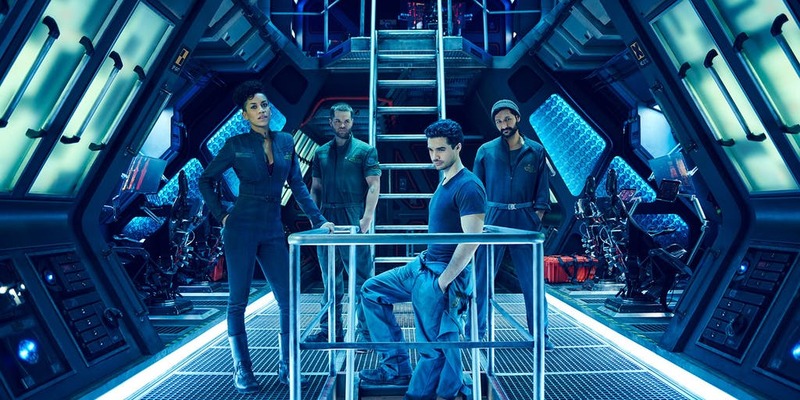 You maybe have heard that SyFy cancelled The Expanse in May 2018, after three seasons. But Amazon picked it up a few weeks later and is funding Season 4. The Expanse gets the top award, in my opinion, for making life in space as compatible with real physics and engineering as any sci-fi show I've ever seen.